THE FIRST CLASS AT M.I.T. THE LAST HOPE FOR A CITY IN PERIL. Boston, 1868. The Civil War may be over but a new war has begun, one between the past and the present, tradition and technology. On a former marshy wasteland, the daring Massachusetts Institute of Technology is rising, its mission to harness science for the benefit of all and to open the doors of opportunity to everyone of merit. But in Boston Harbor a fiery cataclysm throws commerce into chaos, as ships’ instruments spin inexplicably out of control. Soon after, another mysterious catastrophe devastates the heart of the city. Is it sabotage by scientific means or Nature revolting against man’s attempt to control it? The shocking disasters cast a pall over M.I.T. and provoke assaults from all sides—rival Harvard, labor unions, and a sensationalistic press. With their first graduation and the very survival of their groundbreaking college now in doubt, a band of the Institute’s best and brightest students secretly come together to save innocent lives and track down the truth, armed with ingenuity and their unique scientific training. Led by “charity scholar” Marcus Mansfield, a quiet Civil War veteran and one-time machinist struggling to find his footing in rarefied Boston society, the group is rounded out by irrepressible Robert Richards, the bluest of Beacon Hill bluebloods; Edwin Hoyt, class genius; and brilliant freshman Ellen Swallow, the Institute’s lone, ostracized female student. Working against their small secret society, from within and without, are the arrayed forces of a stratified culture determined to resist change at all costs and a dark mastermind bent on the utter destruction of the city. 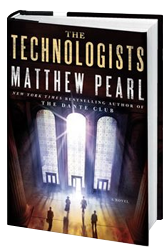 Studded with suspense and soaked in the rich historical atmosphere for which its author is renowned, The Technologists is a dazzling journey into a dangerous world not so very far from our own, as the America we know today begins to shimmer into being. Barton Rogers must investigate the dark side of student life. Click here to download The Professor's Assassin from your favorite site! Tech Forever: A novella featuring the characters of The Technologists. M.I.T., Marcus Mansfield must try to clear his friend of wrongdoing. Close Ranks: Short story following Technologist Edwin Hoyt. against one male student who tries to drive her out of the college.